There isn't any historical setting NBC's newest adventure series Timeless can't conceivably visit and potentially change the outcome of, and that's not necessarily a good thing. The new show from Supernatural creator Eric Kripke and The Shield's Shawn Ryan gives itself a lot of room to work with in a premise that sees three unlikely individuals embark on a mission through time in an effort to halt a villain from altering major events throughout history. The latitude of the premise and the show's apparent willingness to do exactly what its main characters have been tasked with stopping makes for a both an interesting execution of the plot and a massive question as to where, exactly, the show intends to draw the line. 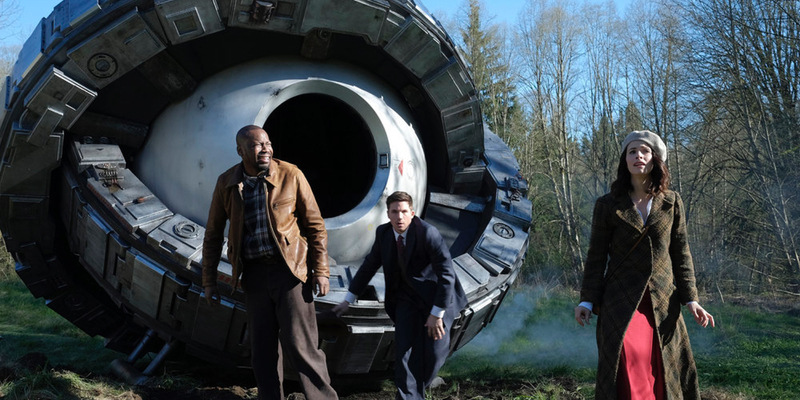 In the first episode alone, the unlikely trio of historian Lucy Preston (Abigail Spencer), soldier Wyatt Logan (Matt Lanter), and engineer/pilot Rufus Carlin (Malcolm Barrett) travel back in time to the Hindenburg disaster in a race to prevent series baddie Garcia Flynn (Goran Visnjic) from upsetting the natural course of history… for reasons. The trio is recruited quickly, with only Spencer's Preston getting much in the way of actual backstory and development outside the rapid plot advancement. This coincides with the equally hasty introduction of Flynn, as he and a group of compatriots infiltrate the super secret facility housing a working time machine created by Connor Mason (Patterson Joseph, The Leftovers) to wreak havoc on the time stream. Soon after, a vaguely official government agent played by House of Cards' Sakina Jaffrey sends Preston, Logan, and a reluctant Carlin into the past to prevent history from being changed. The set up happens so quickly and without so much as a second thought that the viewer is likely to get whiplash. It's almost as though Timeless is convinced that if it moves fast enough, it can prevent the audience from seeing how silly it is from the top down. Now there's always room for a little daftness in television, especially in a fall TV season with plenty of series ready to take themselves as seriously as possible, but the degree to which Timeless just straight up doesn't care how it comes off is somewhat concerning. It's also kind of admirable in a "that kid's got a lot of moxie" kind of way. You want to keep watching partly because you're convinced the show will continue to mine new depths of silliness, but also because it's impressive how much it just doesn't care what you think. If you're still on the fence as to just how little Timeless cares about the manner in which it presents itself, the premiere episode introduces journalist Kate Drummond, and explains her role in history as far as the Hindenburg is concerned. She's a charming woman who quickly catches the eye of Lanter's Logan and soon enough he's messing with history himself, trying to save Drummond from her unfortunate fate as the three intervene in Flynn's still-unclear plans on behalf of people who like their history immutable. Logan's actions are exactly the sort of thing you'd think a show like this would do and so it's not surprising at all when it follows through on them. But at the same time it is a little shocking that Timeless doesn't know any better – or it does and, again, it just doesn't care. The same thing is true for a brief moment halfway through the premiere when Logan explains that his wife had died and how Drummond reminds him of her. Cutting through it all, though, is the engaging Carlin who berates a racist cop in 1937 by letting him in on the post-Civil Rights Movement future. The pilot episode is a whirlwind. It moves so fast it's difficult to discern whether or not Timeless is trying to avoid the consequences of its specific actions or if it simply can't wait to get to the consequences of its main premise. In a twist – at least as far as the first episode is concerned – it turns out the show plans to let its villain succeed, partially because he isn't really as bad as his actions make him out to be and partially because he has some sort of relationship with Preston, though that will have to be a mystery for another day – or as long as the series runs. While this includes the typical sort of intrigue about the antagonist and the truth of his mission, the real mystery may be in how much the show plans to mess around with historical events and in what ways it plans to demonstrate the ramifications of those alterations with the time stream. By allowing Flynn to be partially successful, Timeless introduces endless possibilities for the main crew to have to deal with, as they – for some reason – remain aware when history is changed. And just by altering when the Hindenburg went down (because it still manages to crash and Drummond still dies), Preston returns home to find her once terminally ill mother healthy and her sister Amy to have never existed. This seems to be where Timeless' interest really lies: in the exploration of the consequences faced by its characters' inability to complete their mission. The whole thing is basically 'A Sound of Thunder' on a weekly basis, so, in effect, Flynn's continued victories will help make the series more interesting – for the writers anyway. The problem with this approach isn't so much that it actively encourages the bad guy to win, but that it makes the plot inconsequential, since the only thing that matters is finding out what strange things will have changed for the time travelers when they get back to their own time. Although the series shows some restraint by not suggesting that a victim of the Hindenburg disaster somehow survived as a result of the time travelers' interference, there's no promise it will do the same when it tackles 'The Assassination of Abraham Lincoln.' That's potentially worrisome, but the show does throw in some convenient time travel rules, like the one that says time travelers cannot double back into their own time stream. While that doesn't necessarily assuage concerns completely, it does suggest Timeless has the ability to curb its storytelling instincts, no matter how much freedom it appears to have been given. Timeless continues next Monday with 'The Assassination of Abraham Lincoln' @10 pm.